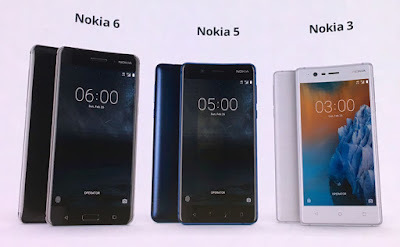 HMD Global Launches Nokia 3, 5 & 6 In India - AndroGuider | One Stop For The Techy You! As expected, HMD Global has released three Android powered handsets in India. The company had unveiled the Nokia 3, 5 and 6 at MWC earlier this year. HMD will be selling the Nokia 6 online in an exclusive partnership with Amazon India, while the Nokia 3 and 5 can be bought from offline retail stores. To ensure healthy offline sales, HMD has partnered with 400 distributors who will sell the Nokia 3 and 5 at 80,000 retail points. Priced at Rs 14.999, Nokia 6 is most expensive of the lot. It sports a metal uni-body design with a 5.5" IPS LCD full HD display which is protected by 2.5D Corning Gorilla Glass. It is powered by Qualcomm's Snapdragon 430 chipset along with 3GB of RAM and a 3,000mAh battery. The smartphone also includes Dolby Atmos and has support for expanding the 32GB internal memory via a microSD card. At it's rear, the Nokia 6 has a 16MP (f/2.0, 1.0µm) shooter while the front facing camera clicks 8MP (f/2.0, 1.2µm) selfies. The phone will be available for pre-orders from July 14. You can view the its full specifications by clicking here. At Rs 12,899, the Nokia 5 comes behind the Nokia 6 in decreasing order of the price segment. It features the same processor as the Nokia 6, that is the Snapdragon 430. The phone comes with a 5.2 inch 720p (HD) display along with Corning Gorilla Glass protection. The mid-range metallic phone includes 2GB of RAM, 13/8MP (f/2.0, 1.2µm) cameras and a 3,000mAh battery. The 4GB RAM variant of the Nokia 5 will not be sold in India. Pre-bookings for the smartphone will start from July 7. You can view the full specifications of the phone by clicking here. The Nokia 3 is priced at Rs 9,499. It features a 5.0" HD screen with an aluminium frame and polycarbonate back. The handset is powered by 2GB RAM along with Mediatek's MT6737 quad-core processor clocked at 1.4 GHz. The front and the back cameras sport an 8MP (f/2.0, 1.2µm) resolution. The smartphone is fueled by a 2,650mAh battery. The Nokia 3 will be available in retail stores starting June 16. You can view the full specifications of the phone by clicking here. All the Nokia phones are powered by Nougat 7.1.1 and will be upgraded to Android O later.